Next up is the HP Pavilion G6-2250SA, a 15.6" laptop manufactured by Hewlett Packard as part of their Pavilion range. Situated in competitive sub £400 market, it offers a fairly decent specification for the money - an Intel Pentium B960 Processor operating at 2.2GHz, 6GB of RAM, and a massive 750GB hard drive, running at 5400rpm. 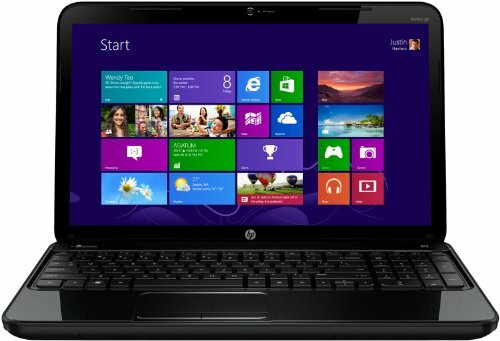 The operating system is the new Windows 8, and the laptop is encased in a rounded black gloss design. Read on for our HP G6-2250SA review. Below is our review of the HP Pavilion G6-2250SA, a 15.6" laptop, featuring 6GB RAM, 750GB hard drive and Windows 8. Hewlett Packard have been making laptops for years, and with the acquisition of Compaq are responsible for a large percentage of the laptop sales both in the UK and worldwide. We test their latest mid range to budget offering - the G6-2250SA, which is part of their Pavilion range. The first thing you notice about the G6-2250SA is the finish - the exterior and indeed the interior of this laptop are encased in a black glossy finish, and surrounded by rounded edges. There isn't a sharp corner to be found on this notebook, and for the most part it looks good - all of our testers liked the overall look and feel of this laptop. The only downside we noticed was that the glossy finish has a tendency to show finger prints - you may need to occasionally wipe the laptop in order to keep it looking new. That aside, on first glance it all looks good. Measuring 38cm in width and 3.6cm in height, it's not the thinnest of laptops, but for sub £400 you can't really complain at this. The processor is the popular Intel Pentium B960, running at 2.2GHz, which in turn is backed up by a generous 6GB of RAM, which combine to keep applications running smoothly. In terms of storage you have a fairly generous hard drive with a total capacity of 750GB - this will be more than adequate for the vast majority of users - it ran fast, at a speed of 5400rpm. Unless you have an exceptionally large media collection then this will be able to provide enough space for you. The keyboard follows the black exterior, with the black keys evenly spaced, which should help alleviate typing errors. Also included is a number pad to the right hand side of the laptop, a handy addition for those who prefer input via that rather than the numerical keys above the keyboard. Both the keys and the touch pad were comfortable to use, providing easy and accurate input for our testers. In terms of connectivity, you are provided with the usual options: a card reader, DVD drive, headphone and microphone jacks, 3 x USB, HDMI, VGA, and a webcam located in the usual centre spot above the 15.6" display. The display itself is surrounded by a thick black bevel, thus enabling you to open and close the laptop without getting fingerprints on the screen. The screen had a crisp picture, and presented colours well - no complaints here. So overall what did we think of the G6-2250SA? Pros: Decent specification, runs fast, all on the latest Windows operating system. A decent value laptop from a reliable manufacturer - if you're in the market for a new laptop then the HP Pavilion G6-2250SA should definitely be a consideration.